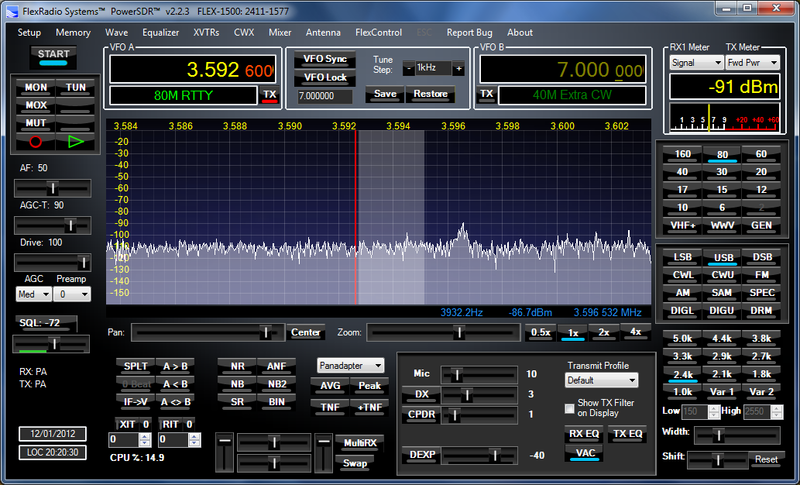 Flex 1500 on 80m on the wire, about -91dBm of noise in a 2.4KHz bandwidth. It's what I've always wanted, a radio which displays proper signal levels (dBm). 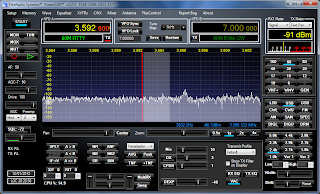 Connected to the WSPR software using Virtual Audio Cable (2 lines) and Com0Com (WSPR using COM5 for CAT, Flex 1500 using COM15). PTT and frequency changing is via CAT, the Flex 1500 appears as a Kenwood TS2000. I've been trying remote control of the radio using TeamViewer and Skype. Set up 2 different Skype accounts, one at home and one on my laptop. Set the home one to auto-answer and use the audio from the Virtual Audio Cable. So now I can tune the Flex 1500 and listen to it from anywhere. TeamViewer has an Android app, so I can still check up on the home PC using my phone, even if it's hard work scrolling around my 1920x1080 desktop on a 320x480 phone screen.